Lyonel Charles Feininger (July 17, 1871– January 13, 1956) was a German-American painter. He also drew cartoons (caricaturist). 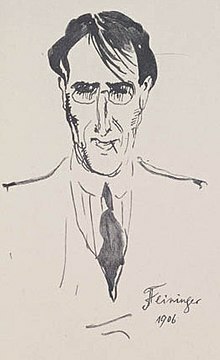 Lyonel Feininger's father was the German violinist Karl Feininger. His mother was the American singer Elizabeth Feininger. Feininger grew up in New York City. Feininger married Clara Fürst, the daughter of the painter Gustav Fürst. They had two daughters. He also had several children with Julia Berg whom he later married. His sons, Andreas Feininger and T. Lux Feininger, both became artists. Andreas was a photographer and T. Lux became a photographer and a painter. He moved to Berlin in 1887 to study at the Königliche Akademie Berlin under Ernst Hancke. Then he studied at art schools in Berlin with Karl Schlabitz, and in Paris with sculptor Filippo Colarossi. He started as a caricaturist in 1894 for several German, French and American magazines. These included Harper's Round Table, Harper's Young People, Humoristische Blätter, Lustige Blätter, Das Narrenschiff, Berliner Tageblatt and Ulk. Feininger's art was chosen to be a part of the annual Berlin Secession art show in the years 1901 through 1903. In 1933, the Nazi Party came to power in Germany. Feininger's wife was partly Jewish, and they decided to leave Germany. The Nazi Party declared his work to be "degenerate." They moved to America after his work was exhibited in the 'degenerate art' (Entartete Kunst) in 1936, but before the 1937 exhibition in Munich. After moving to the United States, Feininger taught at Black Mountain College. Feininger also worked sometimes as a pianist and composer. Music historians still keep several of Feininger's piano compositions and fugues for organ. ↑ 1.0 1.1 1.2 1.3 "Alfred Vance Churchill papers regarding Lyonel Feininger, 1888-1944". Archive of American Art Finding Aids. Smithsonian Institution. Retrieved 2011-07-29. ↑ "Lyonel Feininger (Léonell Charles Feininger) is born in New York City on July 17th. He was the first child of the violinist Karl Feininger from Durlach in Baden (South West Germany) and the American singer Elizabeth Cecilia Feininger, born Lutz, who was also of German descent. " ↑ 3.0 3.1 "Lyonel Feininger". Cartoons. Ohio State University. Retrieved 2011-07-29. ↑ Feininger, T. Lux (1965). Lyonel Feininger: City at the Edge of the World. Frederick A. Praeger. p. 36-76. LCCN 65-25280. Blackbeard, Bill (1994). The Comic Strip Art of Lyonel Feininger. Kitchen Sink Press. ISBN 0-87816-294-3 Check |isbn= value: checksum (help). Feininger, T. Lux (1965). Lyonel Feininger: City at the Edge of the World. Frederick A. Praeger. LCCN 65-25280. Ness, June (1974). Lyonel Feininger. Frederick A. Praeger. LCCN 72-888673. Hartley, marsden (1944). Lyonel Feininger. Museum of Modern Art, New York. This page was last changed on 25 August 2018, at 04:19.